Q: I have attached a photo found among my mother’s possessions after she passed away. She had given me her photos and explained who everyone was, so it was a surprise to find this brooch amongst her jewellery, containing a photo I had never seen before. It was packed in a small box with a piece of paper on which was written "James and Ellen Jenkins 1835". The same has been inscribed by hand on the back of the brooch (the clearest part "1835"). On removing the photo from the brooch I found it had been part of a larger photo and trimmed to size to fit the brooch. The photo is printed onto metal (most likely tin?). The cardboard backing for the photo had also been trimmed to fit the brooch. The only visible inscription on the cardboard is "Gold & Photo Print" and indeed the male has a gold chain at his waist and female a gold brooch at her neck. My dilemma is that if the date is correct, then the photo must be from the very early days of photography and to my knowledge ancestors named James and Ellen do not appear in my family at that time. My Great Grandfather James Elliott Jenkins (b. Dec 1860) and Bertha Ellen Willis (b. May 1861) were both born in Victoria, Australia, and married there in March 1886. James E's father (my Gt Gt Grandfather) was also named James. He was born in England in 1826 and he married Emily Huxtable (born in England in 1823) in 1859 – in Victoria, Australia. It seems that this was a special photo, having the gold added (and it must have been treasured by my mother). I believe tin photos were still in use in 1885. If the date should have been 1853, then Ellen was 30 and still in England as she departed for Australia in 1857. James would have been 27. I have not found when he departed for Australia. Bertha's mother was named Ellen but she was too young also in 1835. I hope you can provide some insight into this mystery. A: As you have discovered, sometimes old family photographs have survived inside pieces of personal jewellery and, as we see, this photo was trimmed to fit inside the brooch. You describe it as being ‘printed onto metal’ and in view of the relatively early date of the image (which I’ll come on to), I suspect this may originally have been not a cheap ‘tintype’ (or ferrotype) photograph, but a luxury daguerreotype – a photographic image struck directly onto a silvered copper plate. Sometimes daguerreotypes were re-touched using coloured watercolour paint and/or gold paint and it was common to pick out small items of jewellery in gold – as noticed here. This practice also explains the inscription on the backing cardboard, which may represent simple instructions to an artist, or, for some reason, a brief description of the picture. Daguerreotypes were the first type of portrait photograph to be produced commercially and the earliest daguerreotype portrait rooms opened to the public in major cities, in 1841. They offered an entirely new, mechanical way of capturing a person’s likeness and the new portrait medium took a few years to become established. Consequently scarcely any surviving daguerreotypes are known to date from before the mid-late 1840s, and in Australia the earliest known surviving daguerreotype is dated 1845. Therefore it is not even remotely possible that a family photograph was taken as early as 1835, as suggested by the inscription on the piece of paper packed with the brooch in the box. We need to date this photograph now, in order to try to solve this puzzle. Fortunately the appearance of our ancestors in old photographs can usually be accurately dated from their appearance, especially when a lady is present. The young woman here is well-dressed in fashionable daywear typical of c.1855-59. Key features are her short jacket-bodice and matching full skirt worn beneath a fine black net or lace wrap or peignoir, the sleeves the open ‘pagoda’ style that dominated the 1850s. Her hair, centrally-parted and dressed into wide swathes at ear level was also one of the main coiffures in vogue during the mid-late 1850s. The man’s appearance cannot be dated so precisely, but his dark, slender frock coat, deep V-fronted waistcoat, black cravat and narrow trousers accord well, being characteristic of male mid-19th century fashions. These two young family members could perhaps be a man and wife, although I cannot discern any wedding bands on the lady’s ring hand, which would be rather unusual, were she married when she posed for this photograph. In view of the probable 1855-59 time frame, we can rule out your great grandparents, James Elliott Jenkins and Bertha Ellen Willis (married 1886), and might consider whether the date was supposed to read ‘1855’ – not ‘1835’. Whatever the date does read (or was supposed to read), it seems that one or both of your great great grandparents – James Jenkins (b.1826) and Emily Huxtable (b.1823) - could perhaps be the subjects here. 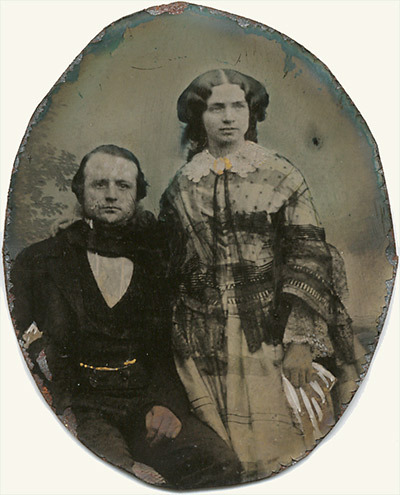 Might the couple have had this intimate photograph taken shortly before, or around the time of their marriage in 1859, despite the lack of an obvious wedding ring? Or did Emily Huxtable visit the photographer with, say a brother, shortly before she left England for Australia in 1857 (you called her Ellen later in your narrative, but presumably you meant Emily) – to create a farewell photograph? A date of either 1857 or 1859 would fit this scene well, so despite the confusion over dates and names, these seem to be plausible explanations.